Presenting our unique new selection of Mookaite, Turritella Agate, Crazy Horse and Ocean Jasper full of rare colors, patterns, shapes and cuts! 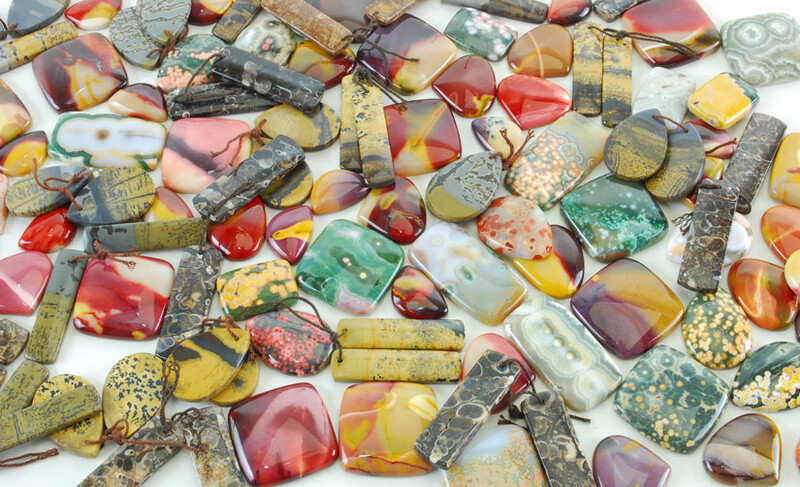 Mookaite is an Australian jasper that combines the lighter colors of yellow and red jasper. In Australia, Mookaite was, and still is, considered to be a healing stone that bestows strength. It is said to shield the wearer from difficult situations and to connect us to loved ones who have passed away. It is believed to bring us into the “here and now”, aiding with problem assessment and decision making. Turritella Agate is a variety of Chalcedony, a mineral of the Quartz family. It is rich, earthy brown or black, and recognized by the sea creature and fossilized snail patterns within the stone, or in a thick coating around it. Turritella Agate is a spiritual crystal, and is believed to be deeply connected to the earth and home, to one’s personal roots and ancestry, even the events of one’s past. It is thought by some to be a survival stone, one of strength and protection. Ancient life held within its form lends the power of wisdom and healing. Crazy Horse Jaspers add a bit of whimsy and wonder to the mix, encouraging us to enjoy life, to seek beauty and humor, and to not take ourselves too seriously. Ocean Jasper, also called Orbicular Jasper, is unusual jasper found only at a remote location on the coast of Madagascar that can only be mined at low tide! 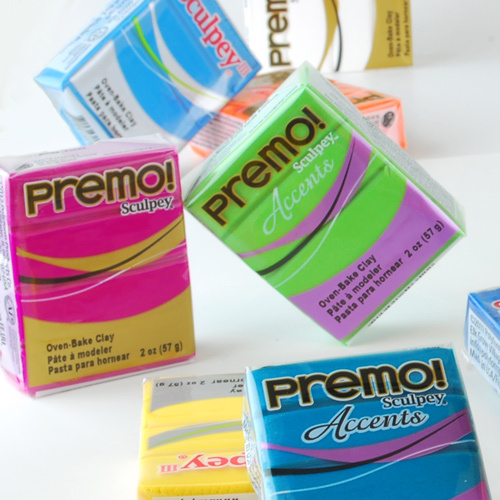 The colors vary widely, including white, green, pink, red, black, blue. 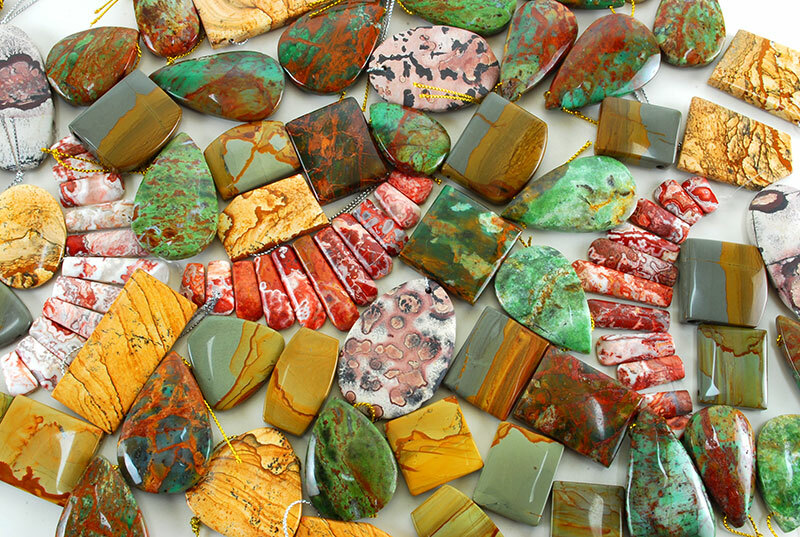 The wild polka dots, wavy lines, and multi colored floret patterns of Ocean Jasper make this a gorgeous and exciting stone. 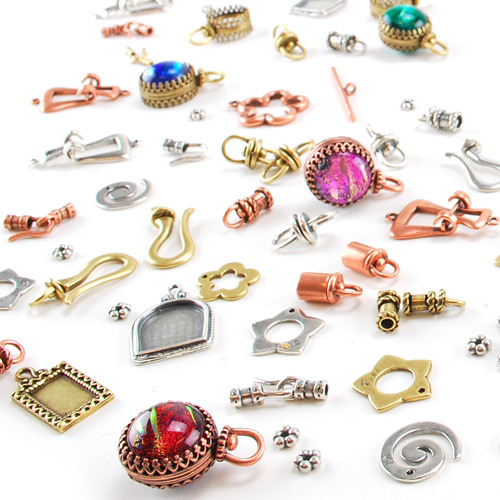 These beautiful gemstones are all different and unique; find freeform cabs, matched pairs, drilled pendants and calibrated shapes. Each image is the individual stone you will receive. Order now before they are gone.